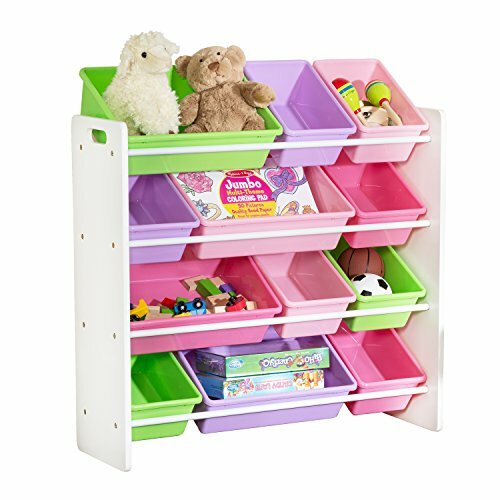 Honey-Can-Do SRT-01603 kids toy organizer and storage bins, white/pastel. The perfect organizer for children's playrooms or bedrooms, these colorful bins make organizing fun and easy, even for small kids. Effortlessly sort doll clothing, toys, craft supplies and more into the sturdy plastic bins. The white wood frame holds 12 containers of varying sizes to keep everything tidy. Each bin measures 5 inches high, providing ample storage space for both small and medium size toys, books, clothing, and more. Bins are removable from the shelves making clean-up time fast and simple. Although perfect for kids toy storage, this handy 12-bin organizer has many other uses. Just use your imagination. (This item also comes in primary colors). includes safety mount hardware to secure unit to wall and help avoid tipping.